Defibrillation involves using an electronic device to deliver an electric shock to the heart, helping reestablish normal contraction rhythms in a heart during cardiac arrest. 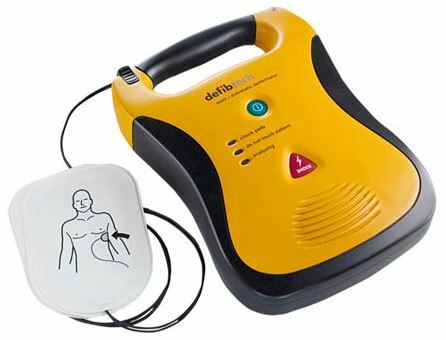 Today, portable defibrillators called automated external defibrillators or AEDs are being used in offices, schools, industrial settings, public buildings, sports stadiums, airports, where large numbers of people congregate and even in private homes. But in order to use an AED properly it is important to learn how to use the device effectively. If you see a person suddenly collapse and pass out, or if you find a person already unconscious, confirm that the person can’t respond. Shout at and shake the person to make sure he or she isn’t sleeping. Never shake an infant or young child. Instead, you can pinch the child to try to wake him or her up. Call 9–1–1 or have someone else call 9–1–1. If two rescuers are present, one can provide CPR (cardiopulmonary resuscitation) while the other calls 9–1–1 and gets the AED. If no one knows how long the person has been unconscious, or if an AED isn't readily available, do 2 minutes of CPR. Then use the AED (if you have one) to check the person. After you use the AED, or if you don't have an AED, give CPR until emergency medical help arrives or until the person begins to move. Try to limit pauses in CPR. After 2 minutes of CPR, you can use the AED again to check the person's heart rhythm and give another shock, if needed. If a shock isn't needed, continue CPR.